The team will look after your every need during your stay. Sanjeeva is the houseman and is in charge of preparing the rooms and looking after your daily needs. Make sure to try his daily smoothies and milkshakes. Ruwan is our marvellous chef, available to cook you breakfast, lunch and dinner. He has worked in Qatar and French restaurants for a number of years. Renown for his rice & curry and seafood dishes.On request Ruwan can cook most Western and local dishes. 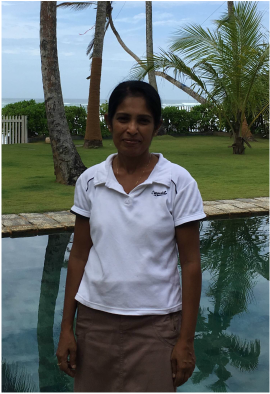 Sunethtra is at Samudra to help with all the laundry at the Villa.She is always friendly and excellent help with Children if required.